I’ve now seen two war movies in a row, and only one of them has the real audacity and emotional weight to it to make the viewing experience a much more compelling watch than anyone would give it credit for. I’ll give you a hint as to which one it is: it’s not 12 Strong. This film, unlike Journey’s End, takes a very familiar wartime era and does all the expected tropes and clichés from a genre like this, but doesn’t really do anything with them except in the most standard and ultimately forgettable manner you could possibly imagine. I’ll be honest, writing this review I’ve already forgotten about half of this movie, and I only saw it less than 24 hours before starting to type it out; that’s how in one ear and out the other this well-intentioned but entirely throwaway war action film is. The film begins just as the world watches in horror on September 11th 2001 when the World Trade Centre is attacked and destroyed. Almost immediately, Captain Mitch Nelson (Chris Hemsworth) lobbies to head to Afghanistan to fight the Taliban militia head on, and soon he and his team of 11 other men are shipped out to the Middle East, where they are tasked with assisting Northern Alliance leader General Abdul Rashid Dostum (Navid Negahban) in retaking the city of Mazar-i-Sharif from the enemy. The set-up is interesting, as it deals with one of the very first American retaliations following the 9/11 attacks at a point where they don’t even know much of the environment or even the artillery that the Taliban have in their grasp, but the execution is extremely familiar; imagine The Magnificent Seven if, instead of the Old West, it was set in the war-torn deserts of Afghanistan, and that’s pretty much what 12 Strong is. Jerry Bruckheimer serves as a producer on this film, and you can kind of tell that this is the kind of big, bloated action epic he has a consistent hard-on for telling, from the numerous explosions to the heavy scenes of gunfire to the bro-culture comradery that the soldiers share with one another. The problem is, it’s all coming from a script that dictates these clichés we’ve seen over and over again be portrayed as exactly that and nothing more, so there’s really not much that we can latch onto in order to care about anything that’s going on. The characters have almost nothing going for them, and the only reason you’re rooting for them at all is because they’re played by Chris Hemsworth, Michael Shannon, Michael Peña, Trevante Rhodes and other good actors who can play these kind of heroic roles in their sleep; only Negahban as General Dostrum, who in real life would go on to become the Vice-President of Afghanistan, gets to show any real semblance of an actual character, whereas all the others are just flat cardboard cut-outs that are completely interchangeable with each other. Like a lot of these modern war movies released around this time of year, like Lone Survivor and American Sniper, this one certainly has noble intentions but uses a few too many clichés of not just the war genre but quite a few others as well, which makes it very predictable and not very exciting to watch; I remember squirming around in my seat for a large portion of this movie just to get the pain out of my leg from sitting down too much, and was honestly more invested in that more than anything else in this movie. Even the action scenes, which for a Bruckheimer production are fairly well done, become tedious after a while when they all look exactly the same as one another, especially as there really aren’t a lot of characters you can follow or have established a strong emotional connection with to care all that much about when they or other people they have befriended are in mortal danger. The movie’s already forgettable enough as it is, but I was really struggling to put this review together, guys; I had to go online and read a plot synopsis just so I could be reminded of what actually happened, and in what order it happened, before I could even put together a comprehensible plot summary. 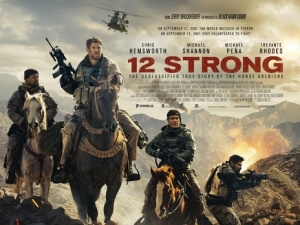 It has noble intentions, as well as a pretty solid cast for a movie like this, but 12 Strong is just completely disposable and not worth seeking out on a big screen, especially as there are far more interesting films like this you could watch instead. 12 Strong may have noble intentions as well as a solid cast, but there is almost nothing interesting that arises from this script which fills itself up with stock clichés and paper-thin characters instead of actual wartime thrills.